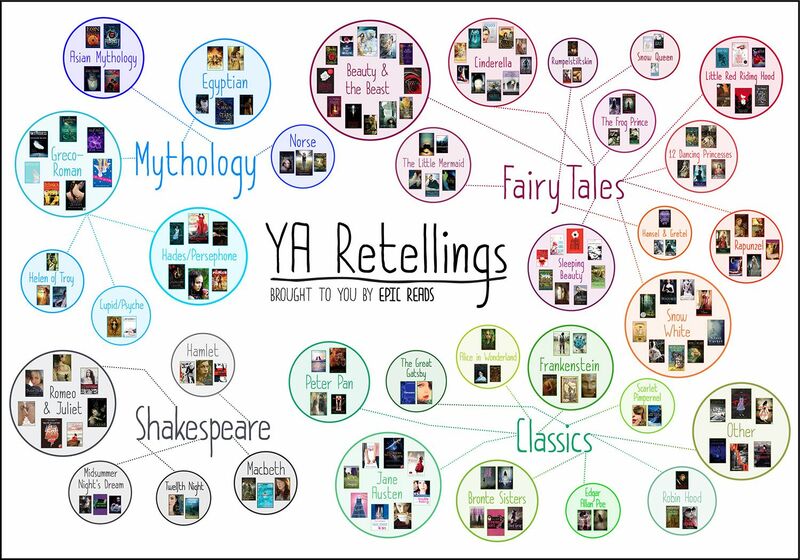 Presenting YA RETELLINGS – an epic infographic brought to you by Epic Reads. 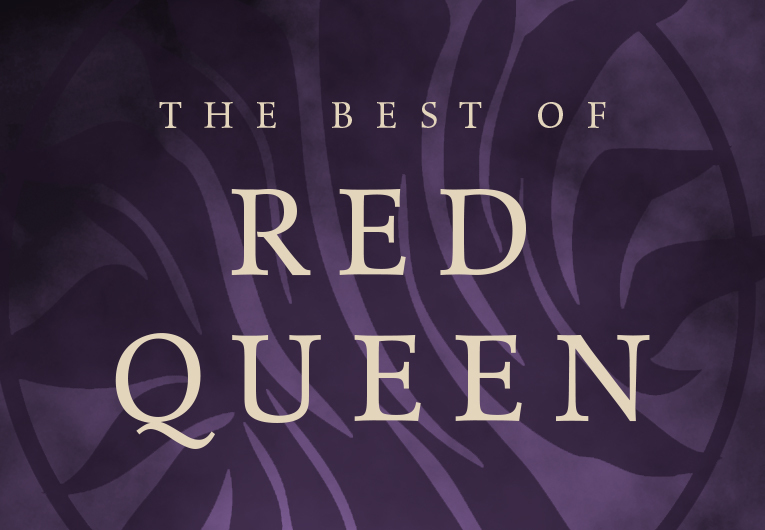 Read your way through this list of 162 young adult books that are all retellings or re-imaginings of popular classic literature, myths, fairy tales and Shakespearean plays. 📢 📢 UPDATE: 📢📢 We have added a few more titles to the lists below and they are indicated as being “Not pictured” so you will know that those are new and will be added to the visuals next winter! Happy reading, book nerds! 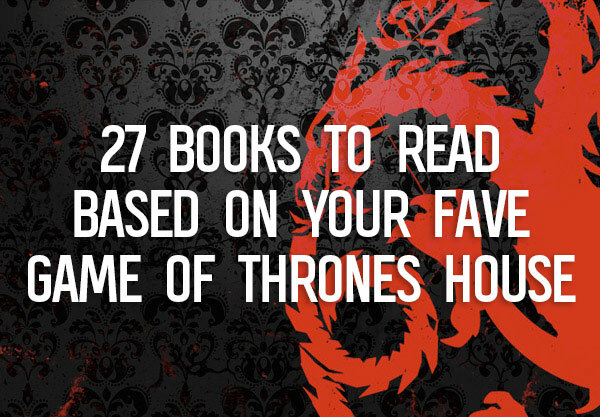 Fun Fact #1: There are 162 books in total on this list. 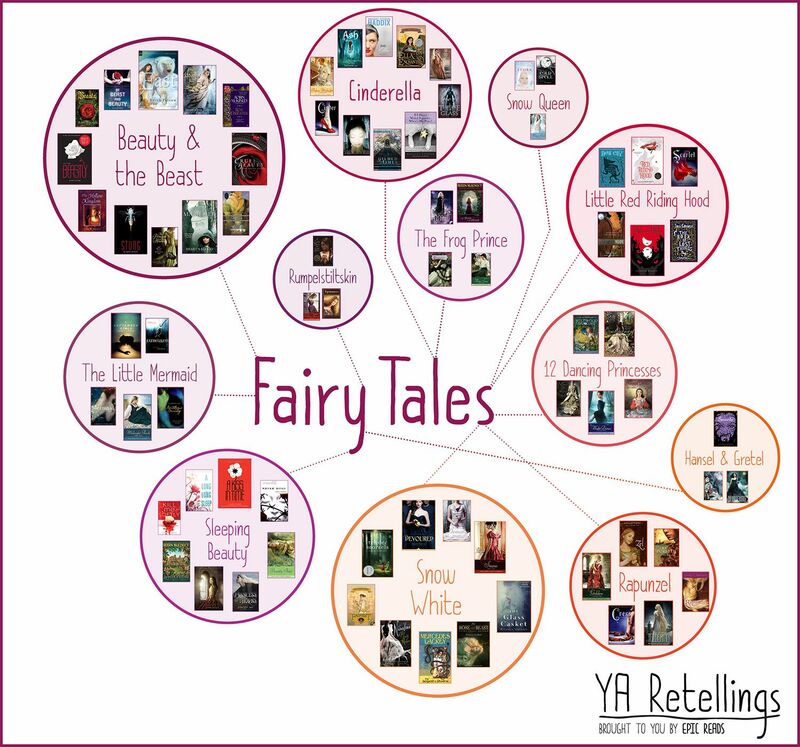 Yes, there are more YA retellings out there that we probably missed or couldn’t find, but this was the most our community could find! Fun Fact #2: They are all young adult books, but some might fall into the “crossover” category with either adult or middle grade. Fun Fact #3: There are 40 classic lit retellings, 74 fairy tale retellings, 30 mythology retellings and 18 Shakespeare retellings. Fun Fact #4: The author featured most times on this list is Cameron Dokey with 5 books! Fun Fact #5: This chart took about 4 months of planning and research, 4 weeks of designing and 8 hours to compose the actual post you’re reading here. Fun Fact #5: There are 68 different colors used in the circles and lines in the design! Click the images to view it in full size! Print versions are available for download here. More print instructions can be found below! Oh you want to print and hang this in your library or bedroom or wherever? We don’t blame you. This chart is gorgeous. We’re making it easy for you! How to print: Here is a PDF you can download from Scribd. This combined PDF includes the full wide and tall versions as well as the section breakouts. We recommend printing the full sized versions on 11 x 17 paper, but you can always print the individual sections and arrange them nicely! Now let’s take a look at each section! Fun Fact #1: Out of the twelve fairy tales, nine are from the Brothers Grimm, two from Hans Christian Anderson and one from Gabrielle-Suzanne Barbot de Villeneuve. Fun Fact #2: Seven of the twelve of the fairy tales were made into Disney movies: Beauty & The Beast, Cinderella, The Little Mermaid, Sleeping Beauty, Snow White, Rapunzel (Tangled), The Frog Prince (The Princess and the Frog), Snow Queen (Frozen). Fun Fact #3: We featured quite a few books from the Once Upon A Time Fairytales series published by Simon Pulse. Check out the full list here. Fun Fact #3: East by Edith Pattou and Sun and Moon, Ice and Snow by Jessica Day George are actually retellings of a Norwegean folktale East o’ the Sun and West o’ the Moon which in itself has many similarities to the Roman myth Cupid & Psyche and the fairy tale Beauty and the Beast. Fun Fact #1: The original story of The Little Mermaid was written by Hans Christian Andersen in 1837! Fun Fact #1: Cinderella, or The Little Glass Slipper, was originally written by Charles Perrault in 1697 but popularized by the Grimm Brothers in 1812. Fun Fact #1: Rumpelstiltskin originated as German folk tales and various versions of it were collected, rewritten and popularized by the Grimm Brothers in 1812. Fun Fact #2: There has not been a YA retelling of Rumpelstiltskin since 2008 when A Curse As Dark As Gold was published. Fun Fact #2: Enchanted by Alethea Kontis is more of a combo of various other fairy tales, but the most notable one is The Frog Prince. Fun Fact #1: Another Hans Christian Andersen original fairy tale! The Snow Queen was first published in 1845. Fun Fact #2: Disney’s Frozen is based on The Snow Queen but, as typical for Disney, it does deviate from the original story. Fun Fact #1: Red Riding Hood (listed below) is based on the movie starring Amanda Seyfried and Max Irons! Fun Fact #2: This is the second Charles Perrault fairy tale we have on the list (the first is Cinderella) and was originally published in 1697 but was popularized by those Grimm Bros, who tamed the story to be a little less gruesome. Fun Fact #1: The first fairy tale on this list that was originally published by the Grimm Brothers! Most of the time they just re-wrote fairy tales that had previously been published. Fun Fact #1: Betwitching by Alex Flinn is another one of those multi-fairy-tale stories but it’s most notable one is Hansel and Gretel! Fun Fact #1: Snow White was first published in the first edition of their collection Grimms’ Fairy Tales in 1812. Fun Fact #1: This is the third Charles Perrault original fairy tale to be featured on this list. His version was published in 1697 and was, of course, popularized by the Grimm Brothers. Fun Fact #1: Four of the five original stories were written by women: Bronte Sisters, Jane Austen and Mary Shelley. Fun Fact #2: There’s a section in this category labeled “other.” This section contains YA retellings of classic stories, but they are the only young adult retellings that we could find. For example, The Madman’s Daughter by Megan Shepherd is the only YA version of The Island of Doctor Moreau by H.G. Wells that we could find. We didn’t want to exclude these retellings because we think they deserve to be on this list, but they are so unique that they are the only ones, they get their own section! Fun Fact #1: Originally published in 1925 by F. Scott Fitzgerald. Fun Fact #1: Peter Pan, or Peter and Wendy, is J. M. Barrie’s most famous work, in the form of a 1904 play and a 1911 novel. Fun Fact #2: The original novel was actually published for adults! Fun Fact #1: Originally published in 1865 by author Charles Lutwidge Dodgson under the pseudonym Lewis Carroll. Fun Fact #2: While researching retellings of this classic tale, we honestly thought we would find more, but only came upon these three! Fun Fact #2: When the book was first published, Mary Shelley’s name did not appear on the cover and thus caused quite a bit of confusion as to who authored the book. As a result, the book wasn’t very well received when it first went to print! Fun Fact #1: Like other classic works on this list, The Scarlet Pimpernel started out as a play. It was published in 1903 and written by Baroness Emma Orczy. Fun Fact #2: The original play is set during the Reign of Terror following the start of the French Revolution. Fun Fact #1: The earliest surviving text of a Robin Hood ballad is “Robin Hood and the Monk” in 1450. Fun Fact #2: Robin Hood: Men in Tights (1993) is one of the greatest comedies of all time and if you disagree with this statement you are wrong. Fun Fact #1: Masque of the Red Death is a retelling of the Poe story of the same name and The Fall is a retelling of Poe’s The Fall of the House of Usher! Fun Fact #1: Of her six published novels, there are only 14 kisses in total. Fun Fact #2: The earliest recorded use of the word ‘baseball’ in an English novel is in Jane Austen’s Northanger Abbey written in 1798-1799. Fun Fact #1: There are three Brontë sisters: Charlotte, Emily and Anne. Fun Fact #2: The sisters originally published their poems and novels under masculine pseudonyms, following the custom of the times practiced by female writers. Fun Fact #2: Only men were allowed to perform in the theater. Therefore, all of Shakespeare’s characters were played by men. . .
Fun Fact #3: The only authors to appear more than once on this list are Louise Rennison and Lisa M. Klein! Fun Fact #4: We don’t include “A” in A Midsummer Night’s Dream on the chart because we couldn’t make it fit! Apologies to Mr. Shakespeare. Fun Fact #1: Will Shakespeare did not create this tale out of his imagination. In fact, he borrowed heavily from an Italian tale, translated into verse as The Tragical History of Romeus and Juliet by Arthur Brooke in 1562. Fun Fact #2: One of the earliest references to the names Montague and Capulet is from Dante’s Divine Comedy. Fun Fact #1: Hamlet is Shakespeare’s longest play and was one of his most popular works during his lifetime. Fun Fact #2: Sigmund Freud and other leaders in psychoanalysis studied this play religiously during the first half of the 20th century. Fun Fact #1: Macbeth is the only Shakespeare play that mentions a rhino!!! Fun Fact #2: If you do say “Macbeth” in a theatre, you are meant to walk three times in a circle anti-clockwise, then say a rude word or spit. Fun Fact #1: Twelfth Night is the only Shakespeare play that includes neither of the words ‘child’ nor ‘children’. Fun Fact #1: Mythology was probably the most difficult section to put together because a lot of the retellings aren’t full retellings, but just contain certain mythological elements. It was hard trying to decide what books to include and not include. Also, some of the books intermingle mythology with history, so again, it was a bit difficult to narrow down this one! Fun Fact #2: The majority of the retellings were derivative of classical myths, so we broke the Greco-Roman section down even further by general and then three specific myths! Fun Fact #1: Prophecy by Ellen Oh is based on Korean mythology, Silver Phoenix by Cindy Pon is based on Chinese mythology and Stormdancer by Jay Kristoff is based on Japanese mythology. Fun Fact #1: Today, cats rule the Internet. A long time ago, they pretty much ruled Egypt. In Egyptian mythology, cats were worshipped as deities. In real life, Egyptians were so obsessed with cats that they extended the practice of mummification to felines. Fun Fact #2: Most of the books listed below combine real historical elements and characters with Egyptian mythology. Fun Fact #1: Frost is the sequel to Stork which appears on the fairy tales list as a retelling of The Snow Queen! Fun Fact #1: The three myths featured on this list all involve kidnappings: Psyche was kidnapped by Cupid to be his wife, Persephone was kidnapped by Hades to be his wife, and Helen was kidnapped by Paris to be his wife. Whew! That’s it for this giant list and infographic! 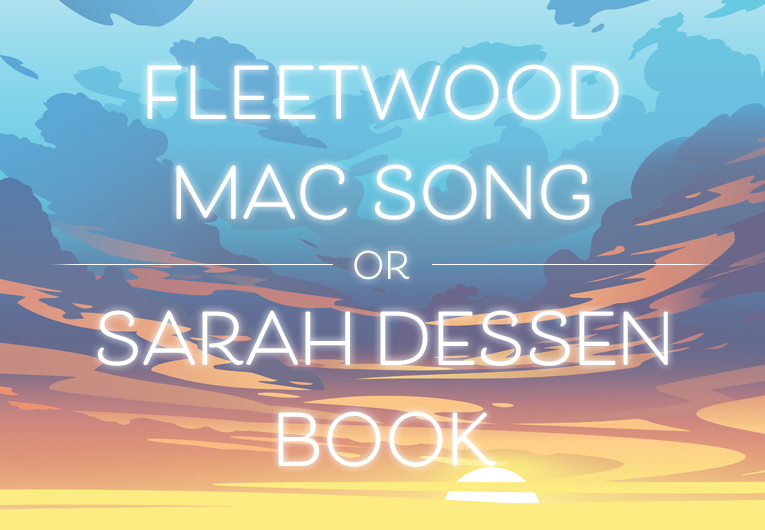 How many retellings have you read on this list? If you are looking for more infographics, click here! 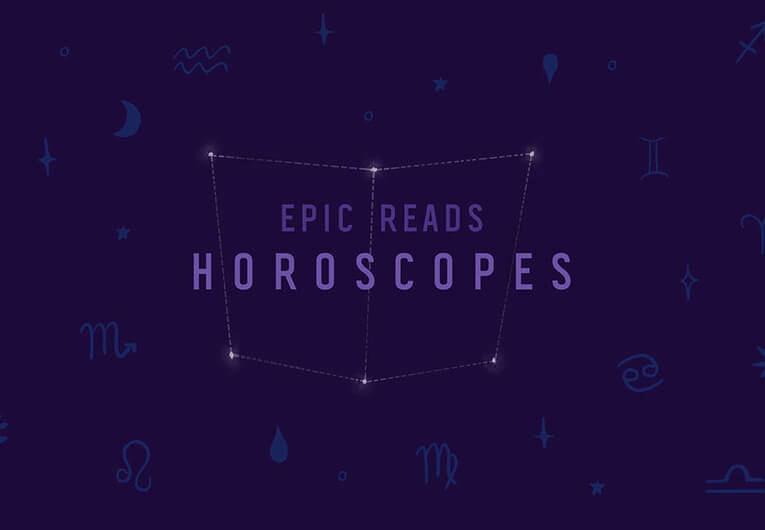 More graphics from Epic Reads!